Owing to higher resistance against corrosion and impact as compared to conventional materials, the vinyl ester market has witnessed increasing consumption from the chemicals, energy and marine industries. These segments utilize vinyl esters for coating and protecting equipment, pipes and storage tanks where characteristics like chemical and abrasion, low permeability and reactivity are critical. 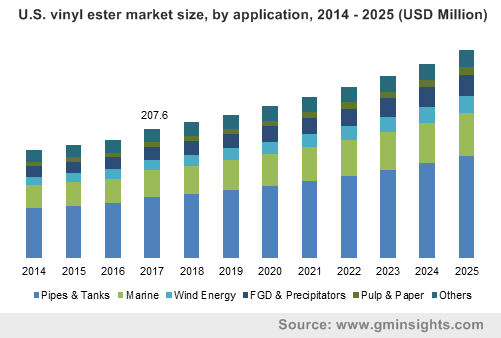 Although use of these materials by the wind energy segment has been cumulating gradually over the last few years, the vinyl ester industry will continue to amass quite some returns from the chemical processing sector. Applying protective layers on steel and other metal tanks and pipes is a key application of vinyl esters, for ensuring improved performance and countering corrosion challenges. Consistent demand for chemical resistant pipes and tanks for chemical manufacturing, storage and supply will strengthen the vinyl ester market, which recorded earnings of more than USD 1 billion in 2017 globally. In addition to being suitable for linings in steel and concrete tanks, pipes and other enclosures, these materials can be used in the fabrication of FRP pipes and storage tanks as well. The growing chemical sector will boost the utilization of high performance storage tanks and fuel the expansion of the vinyl ester industry. Citing an example to demonstrate the growth potential of the chemicals segment, Wanhua Chemical has recently announced it would be constructing a USD 1.25 billion chemical manufacturing facility in Louisiana, U.S.
Wanhua’s new plant would be producing methylene diphenyl diisocyanate, which is applicable to various industries, and the construction is expected to be completed by 2021. A facility of this size would require several storage tanks as well as a vast network of chemical and corrosion resistant pipes. As other chemical giants look to expand their businesses and undertake similar projects, the vinyl ester market will be presented with immensely lucrative growth prospects. Petrochemical producers also cater to large number of industry segments and require reliable storage tanks having exceptional performance characteristics. Leading petrochemical company, Saudi Aramco, had unveiled in April 2018 its plants to establish a multi-billion dollar chemical facility in Texas and had indicated expansion of its existing operations in the U.S. Separately, the Asia-Pacific (APAC) region is also bursting with capital inflow and investments directed towards industrial development, which includes the chemicals segment. Global chemical industry revenues were estimated to be around USD 3,830 billion in 2016, out of which China contributed approx. USD 1,517 billion in sales of chemicals. Evidently, APAC represents a major vinyl ester market and also held the dominant share the previous year. China itself accounted for more than 50% share of the APAC vinyl ester industry in 2017 and is expected to maintain its lead with the help of the booming chemical and petrochemical sectors. APAC is a major consumer of automobiles, electronics, plastic and other products which are some key applications of the petrochemical segment. In November this year DuPont had informed that it will build a new plant in China’s Jiangsu province, at the Yangtze River International Chemical Industrial Park and would commence operations in phases from 2020 to 2023. The company and its affiliates have reportedly accelerated their expansion efforts in the APAC as China, India and other countries have become significant industrial producers worldwide. Expounding on the opportunities for the deployment of storage tanks and anti-corrosive pipes in APAC, India’s Bharat Petroleum Corporation Limited has confirmed its plans to construct a petrochemicals plant in Raigad district, Maharashtra and will invest a total of almost USD 5.6 billion on it. Further, JG Summit Petrochemical will also be expanding its Philippines operations to upgrade its polypropylene plant’s capacity to 300,000 tpy and polyethylene plant capacity to 250,000 tpy. It is apparent from these projects that the petrochemicals industry will tremendously propel the pipes and tanks segment, boosting the APAC vinyl ester market. APAC region has experienced an interest from not only Asian manufacturers but also European companies like BASF, Bayer and Sibur aiming to sell and manufacture their chemical products in countries like China. Consequently, the APAC vinyl ester industry will garner massive remunerations from the augmented demand for highly dependable pipes and tanks in the chemicals segment. A rather consolidated vertical, the competitive landscape of global vinyl ester market essentially consists of vital contenders like Ashland, Sino Polymer Co. Ltd., Hexion, Swancor Holding, Showa Denko and Interplastic Corporation.